I have a number of friends that are expecting this Autumn so I decided that I would knit them each a blanket. I know most of them will have many blankets so I thought I would make them something slightly different. This blanket is designed to be the right size for a buggy or pram. I know I am a first time Mum, but I obsessed way too much about every aspect to do with my son. One thing I struggled with was finding a blanket that was right for when we went out and about (do you remember all that snow a few years ago? He was born in the middle of that. The roads literally cleared long enough for me to get to hospital and get home again before they were snowed up again). Anyway it was cold and I didn’t want him to get too cold when we went out but at the same time I worried that if I used a larger blanket and folded over, it would make him too hot (I am expecting to be a little more relaxed with the next one!). Someone very kind gave us a lovely blanket that was just perfect and now I want to return the favour! I’ve got three different patterns in mind and over the next few weeks, as I knit them up and work out the little kinks, I’ll post pictures along with the patterns (just in case anyone else wants to knit the blankets up). 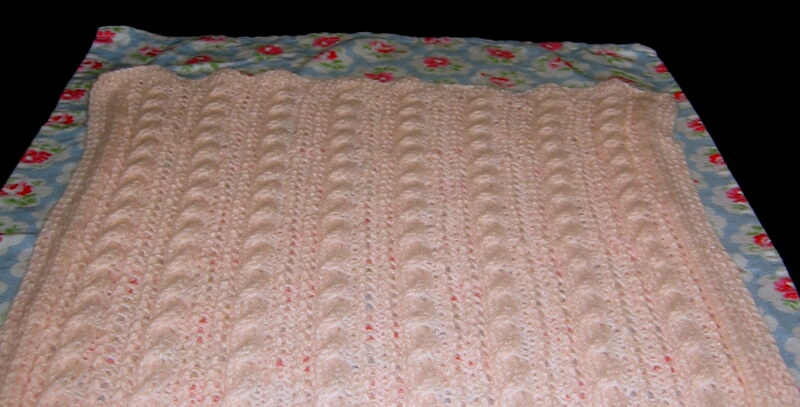 This pic is a sneaky peak at the first blanket.